As I have a 3phase system installed here, I can provide you with some graphs or input. To make matters worst, I have some friendly neighbours/solarpanel installers who ignore the Belgian voltage capping and often on sunny days I manage to measure 250V and beyond on one of my phases, causing high voltage spikes and drops which shutdown one of my PV systems. I have 2 solar invertors, one connected to the 1st phase (green) and one connected to the 2nd phase (red). The panels are located on 2 sides of the house, facing east and west. Green is east, red = west. All these values are measured on a seperate voltage transformer for each phase. I have 3 outlets installed near my electricity cabinet, one for each phase and thus connecting one adapter to one TX. I use some of the openenergy community i2c magic to couple the 3+1 TX boards together and send the data to my local emoncms installation. I really like your solution with the ESP; I was in the process of building a 3 x 12 CT board with an arduino due, but it got on the bench due to lack of time and I feel like it might be replaced by this nice piece of hardware. Another way is to just use the generic CT specification on L2 and L3 and add 120 and 240 degrees to the phase lead respectively. I played around with this and tried to set up the IotaWatt for three phase systems. But I did not succeed with this. Btw there is a simple method to test a three phase setup with only one phase. Set all three CTs around the single phase. Now the first CT should of course measure the correct power, the second and third will show exactly the half of that and the value is negative and the power factor is also -0.5 if you have a pure resistive load on the single phase like a kettle causes. The reason is that cos(120) and cos(240) are both -0.5. Actually I wanted to post some screenshots of what I tried, but I can’t connect to the IotaWatt at the moment. The reason is that I moved the IotaWatt to another location for the three phase test. At the new location the IotaWatt opened the access point again (which was of course what I suspected) but it was not possible to connect. I tried a half an hour with a lot of hard resets till I eventually succeeded. Back at home I can now reproduce the problem with a mac and a windows laptop and I did not succeed till now. I feel like it might be replaced by this nice piece of hardware. Sounds like you have everything already in place to install an IotaWatt. The hurdle seems to be availability of three voltage references which you have already in place. I’m going to send OEM some adapters to connect a standard VT to an IoTaWatt 3.5mm input. It’s a simple circuit with one resistor. If you decide to order an IotaWatt, specify that you need two of these adapters. When they get them, they will forward to you. Keep me posted on your progress. We are very interested in getting some user experience with the various techniques available in the IotaWatt. This method did occur to me awhile back, but not having any real-world experience with three-phase, it just seems too simple. I have to respect that the resident three-phase guy in these parts has never suggested it, and went to great lengths to do a phase shifted approach of the one VT. I had it in the back of my mind to research it. I have confidence it would be good for unity PF, but would have to do some math to determine if it would hold true as the PF drops. Id be interested in trying to get the phase shifted CT method working and then compare the output to the doubling method. First on a unity load, then on something with a low power factor. WiFi range can be an issue. I’ve got one in an outbuilding measuring my meter feed. It doesn’t connect when it rains. When the rain stops, it uploads the backlog. I do have a couple of little plug in WiFi relays that I’ve used in the past. They work fine and solve the range problem. WiFi range can be an issue. I thought the same, but also standing directly beside the IotaWatt, does unfortunately not solve it. Not following you. Are you saying you cannot to the IotaWatt in AP mode? What is the failure mode? Do you see the AP on your device? Are you saying you cannot to the IotaWatt in AP mode? Yes exactly. I moved the IotaWatt to a new location, so I had to connect it to the new WiFi network there. I can see the AP, but I cannot connect. It means: The connection to WiFi-network “iota2329763” could not be established. The connection to WiFi-network “iota2329763” could not be established. OK, what are you using for a password? Initially it’s IotaWatt - case sensitive, but if you renamed your device, the password will be that name. what are you using for a password? I did not change the name and the password “IotaWatt” is saved in the keychain of my OS, so typing in the wrong password can actually not be the issue. But after a lot of resets I managed to establish a connection and finally changed the WiFi settings, so it’s working again. Does changing WiFi settings work for you without issues? Maybe there is something wrong with only my IotaWatt? In any event, it’s not something you would be doing regularly and you got through it. New user here. I’m in AU with 3 phase power very interested in setting up an iotawatt based monitoring kit. I’ve got 27 circuits in total that I want to monitor (including the 3 main lines). I have got access to each of the three phases where the devices will be installed, so tapping into each for voltage references is no problem. I was hoping to do this with two iotawatt devices, but after reading this thread, the documentation for the device, and playing with the demo UI, I have a few questions about how this might be possible. I understand that I can use one of the CT inputs as a voltage reference input; hence one of the two iotawatt devices will have two voltage references. What I can’t get my head around is how I would configure the voltage references for each of the three phases in a way that somehow identifies the phase of each of them in order to “link” each of the respective CT inputs. To put another way, I assume that I would need to specify which phase each CT input must reference; it is this that I cannot immediately see a method to do. The second apparent issue is that there will have to be some circuits from, say, phase C that will need to be measured by the iotawatt device that only has a voltage reference for phase A (given that the other iotawatt device has the voltage references for phases B and C, and all circuits from both phases B and C will exceed 13). This would either need to be done from EmonCMS, or the iotawatt devices will need to talk to eachother in order to share voltage reference data. I have a feeling that neither are possible. A curly one, I’d say. Does anyone have any ideas? understand that I can use one of the CT inputs as a voltage reference input; hence one of the two iotawatt devices will have two voltage references. What I can’t get my head around is how I would configure the voltage references for each of the three phases in a way that somehow identifies the phase of each of them in order to “link” each of the respective CT inputs. To put another way, I assume that I would need to specify which phase each CT input must reference; it is this that I cannot immediately see a method to do. In the interest of keeping it simple, I don’t expose three phase complexity in single phase configurations. The demo app at iotawatt.com is a little outdated, but nevertheless contains what you are asking about. If you run the demo and configure a second VT, you will find that an additional field is presented when configuring CTs. It is a dropdown menu from which you would select the voltage reference for that CT. Try it. The way I might approach this, given you intend to use two IoTaWatt, would be to use the primary voltage reference channels for two of the phases. So for instance IoTaWatt 1 would have (in your terminology) phase A. IoTaWatt 2 would have phase B. Then I would split the output of a third VT on phase C and connect it to both IoTaWatt, using adapters. So you would have A and C on IoTaWatt 1; B and C on IoTaWatt 2. As long as there are not more than 13 CTs on either A or B, you should be OK.
That scheme would allow for 26 circuits to be measured. The IoTaWatt do not talk to each other to share voltage data, or anything else. They are each independent. Aggregation of the measurements from multiple IoTaWatt would need to be worked out in Emoncms or some other service. Bob have you got a circuit diagram for connecting the extra VT’s? Grateful for the quick reply. Your answer makes absolute sense, and I did give it a shot in the demo and can see what you mean. I should be able to get by with 26 CT channels, so I will try that and see how it goes. 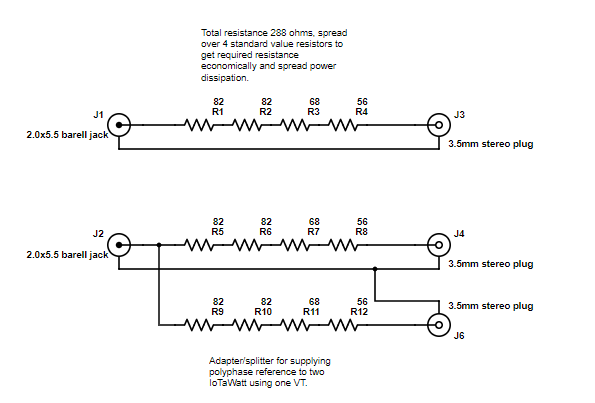 A subsequent question: What do I need to do about the internal resistor on inputs 1-14 if I wish to use them as VT inputs, and is the process to connect an AC transformer to one of those inputs the same as connecting it to input 0? Apologies if this is documented elsewhere - feel free to redirect me if so. Looking forward to getting my hands on your creation! With the method I’ve been using, the internal burden resistors remain in place as part of a voltage divider created with the external resistor. It’s not the ideal setup, as it uses more power than the primary VT (~400mw vs 10mw) but it is so simple and requires no modification to the IoTaWatt - the holy grail. I’ve been using 1/2watt 287 ohm resistors, which are dissipating 70% of their rated power and get slightly warm, but it’s not a lot of power and could be easily built with greater power handling margin. Going forward, I’m going to recommend using a bundle of three 1K and one 2K resistors in parallel to get 286 ohms and a lot more surface area to dissipate the power. Unlike the 287 ohm .1% 1/2 watt resistors I’ve been using, the 1K and 2K are more commodity and the bundle would actually cost less than the one 287 I’ve been using. The power through the internal 24 ohm “burden” resistor is exactly the same as when it is used as a CT channel. I’ve had other questions about this today, so I’ll be publishing a diagram later, and I’ll break out the extra circuitry you will need to make a splitter adapter. nd is the process to connect an AC transformer to one of those inputs the same as connecting it to input 0? You will need an adapter such as the lower one pictured here. It will accept the output from the phase C VT and provide two 3.5mm plugs to go into the two IoTaWatt. Resistors should be 1/4watt or better. These are all standard resistor values, so they should be available in 1% or better. If you don’t have a decent rms voltmeter for calibration, try to get .5% or better. I got the following hardware. 1 x IoTaWatt with Power Supply 5V DC, AC Voltage Sensor Adaptor. After some network problems I made some attempts. Now just for clarification, as I have only one voltage sensor I will have a mistake on 2 phases? The same at 2 phases on solar side? The mistake will be the difference of voltage from phase 1 to the other 2 phases? If I would buy 2 more voltage sensors I would have to solder another jack so I can plug in to the input channels? Or can I buy voltage sensors with the correct jack? Now just for clarification, as I have only one voltage sensor I will have a mistake on 2 phases? Yes, the power indicated in the other two phases will be about 1/2. The same at 2 phases on solar side? The mistake will be the difference of voltage from phase 1 to the other 2 phases? A difference in voltage would cause an error, but the real problem is that the reference voltage is out of phase with the current. If I would buy 2 more voltage sensors I would have to solder another jack so I can plug in to the input channels? You cannot plug a VT directly into the IoTaWatt except on channel zero where there is a 5.5mm jack. If you were to change the jack, you would damage the IoTaWatt. You would see a little smoke come out. Or can I buy voltage sensors with the correct jack? I am developing an adapter that can be used to connect the additional VTs. My intention is to have them available around the end of January. This is over my head, so I don’t want to say if it would do what you need. The iotawatt can measure the power of multiple phases, with three reference transformers, but I think you would need to have an electrician look at your setup and determine where and how to measure the things you need. My concern is that this is only the beginning. You asked about a lot of things that I don’t feel competent to help you with. When the VT adapters come available, you could order one (one services two VTs) and two additional VTs. By then, there will be a wiki page explaining how to set up a basic three phase IoTaWatt system. I’m sorry that I can’t be of more help, but there are others on this forum who may be more knowledgeable about the other requirements that you have and might be willing to get involved. and configure a second VT, you will find that an additional field is presented when configuring CTs. It is a dropdown menu from which you would select the voltage reference for that CT. I suspect that it takes a hardware intervention, so you can use this menu item. With your adapter it will then go without hardware intervention. Every house in Switzerland is connected to a three-phase system. If I want to measure the voltage with a VT for each phase, this is very difficult to do. One would have to install a separate socket for each phase. The IotaWatt could not be installed so easily. For me it would be acceptable to do without a voltmeter. I could live well with the accuracy of plus minus 5%. I only need the measurement for comparison or control and to find big consumers, for example. I do not need absolute and exact numbers. Would it be possible to create a virtual VT while configuring the VT? This means that I can enter a voltage that is the same on all three phases and is a fix voltage, not a measured. Unfortunately, I understand the connections at IotaWatt between hardware, firmware and software not yet. Who would be responsible for such a program change? You seem to be looking for what this person has done.Three Phase with one VT Please read the associated thread. This is a method that now seems to work, but the user interface needs to be simplified. I have put that on the list. In the meantime, you could try to do as he describes, or converse with him about what he has done. I believe there is a ten hour time difference, so be patient. There is a lot of interest in three-phase from Switzerland, Germany, Australia and New Zealand. I expect this will get worked out over the next few months.